SAN FRANCISCO (REUTERS) - In the first real-world commercial use of autonomous trucking, some 45,000 cans of Budweiser beer arrived late last week to a warehouse after traveling more than 120 highway miles (190km) in a self-driving truck with no driver at the wheel, executives from Uber and Anheuser-Busch said. 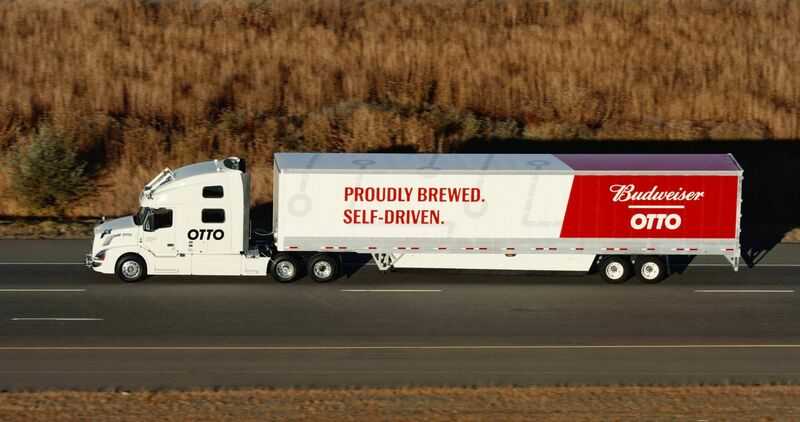 Otto, the self-driving truck subsidiary of Uber, shipped a truckload of Budweiser from Fort Collins, Colorado to Colorado Springs last Thursday (Oct 20) with the driver monitoring from the truck's sleeper berth for the entire two-hour journey, Otto's co-founder Lior Ron and Anheuser-Busch's senior director of logistics strategy, James Sembrot, told Reuters on Friday. The early morning drive at an average speed of 89kmh marks what the two executives said was the first revenue generating load transported via autonomous truck. Otto was paid the market rate of US$470 (S$650) for the job using one of its trucks outfitted with the new technology. Otto and Anheuser-Busch enlisted the support of the state of Colorado before the drive, and the state patrol monitored it, although Colorado and most other US states do not expressly prohibit self-driving trucks. The only time the truck driver delivering the beer took to the wheel was while driving on and off the highway ramp, an Otto spokesman said on Monday. Transportation experts predict the earliest applications of autonomous technology will be in self-driving trucks, not cars. The technology is best suited to the relative predictability of long hauls on highways, rather than busy city streets with many distractions. Another Silicon Valley company, Peloton Technology, is testing driver-assisted "platooning" in which trucks communicate, travelling in close formation to reduce drag and save on fuel, while increasing safety. Otto, co-founded by Google car and map project veterans Anthony Levandowski and Ron, was acquired in August by Uber, which is trying to advance self-driving technology in its ride services business. Ron told Reuters that Otto plans to involve more commercial partners and independent drivers who will use the technology, designed to increase safety and decrease costs as the truck is able to be operated 24 hours a day and seven days a week. The biggest cost savings for the trucking industry will eventually come from eliminating the driver entirely, but Ron said drivers would remain inside the trucks "for the foreseeable future". "We can see a future where this type of equipment is standard on all trucks," said Mr James Sembrot, Anheuser-Busch's senior director of logistics strategy, who said the company logs 450 million miles (725 million kilometres) on US highways annually.